THEY improv continues to change the face of comedy in Florida. With troupes located in Miami, Fort Lauderdale, the Keys, Fort Myers, Tampa, Orlando, Tallahassee and Jacksonville, THEY improv provides the top improvisational talent of the areas they serve. THEY improv is ready to provide you with a performance for your Florida corporate comedy events, private parties and murder mystery dinners that won't soon be forgotten. THEY improv leads the way by providing quality Florida corporate comedy events, private party entertainment and murder mystery dinners. 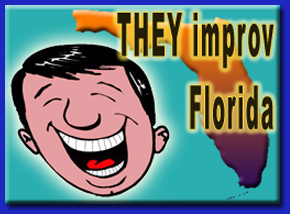 With a rapidly growing list of satisfied clients ranging from families to Fortune 500 companies, THEY improv continues to change the face of comedy in the Sunshine State. Their collection of audience-friendly shows allows them to handle just about any situation with a flair that is enjoyed by all in attendance. From full comedy shows to game shows, murder mysteries and character interactions, THEY improv has something that can help you achieve your goals. Florida has been a favorite retreat for companies and families for years, and now THEY improv is in a position to take care of your entertainment needs. The Sunshine State is a diverse state that has different areas that have very different backgrounds. Whether it is for groups in the urban areas of Miami, Tampa or Orlando, in the more rural areas or within the resorts along the coastal areas, having an understanding of the different parts of the state can mean the difference between a successful gathering. The capital city of the state is Tallahassee. While much of its history is strained, the future is bright. We can handle any kind of show that you would like there or throughout the rest of the state. Simply contact us to find out what programs might work for your group. In addition to their private parties, THEY also offers a variety of training available to business clients through team building, creativity workshops, improvisational workshops, scavenger hunts and many other methods. If you have a company in, or going to Florida looking for unique and entertaining methods for improving your business, look to THEY improv, LLC. Contact us today to find out more about how THEY improv can help your business. Email the director of THEY improv at info@theyimprov.com or call our offices at (866) 219-4386.